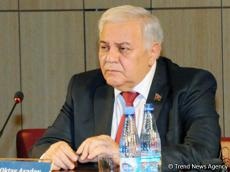 Ogtay Asadov, the speaker of the Azerbaijani Parliament, commented on Friday on the installation of the bust of Mikhail Avagyan, involved in the occupation of Azerbaijani lands, in Samtskhe–Javakheti region of Georgia. Asadov said that the Ministry of Foreign Affairs of Azerbaijan called the ambassador of Georgia in connection with this situation, and the ambassador of Azerbaijan to Georgia country made a visit to the Georgian Foreign Ministry. "We are working on this issue. I believe that the Georgian government will pay attention to this issue, and it will be resolved soon," the speaker said.